This is adapted from the NPC (UK) publication by Dawn Plimmer, February 2013: Version 1.0 visit NPC site to download PDF. that will be better off in work than on benefits). Jobseekers have improved skills and attitudes for employment: jobseekers are more likely to find and enter employment as a result of improved functional skills; interpersonal skills; motivation, attitudes and behaviours; and skills for finding work. skills, and attaining relevant work experience. sustain work for a specified period. Increased numbers of individuals that enter work are satisfied with their employment: people that enter work are satisfied with their job (security, rewards, and the job itself) and their ability to make choices in their employment situation, including prospects for advancement. Educational attainment: Skill levels heavily impact upon employability: poor literacy, poor numeracy and low-level qualifications are associated with long-term unemployment. Fewer than half of those with no qualifications are in work, compared to nearly 90% of those with graduate-level qualifications. People with poor numeracy skills are more than twice as likely to be unemployed as those who are competent at numeracy. Poor literacy skills can also be a serious barrier to progressing once in employment: 63% of men and 75% of women with very low literacy skills have never received a promotion. Disability: Having a disability significantly affects an individual’s employment prospects. Only half of disabled people of working age are in work (50%), compared with 80% of non disabled people. The average gross hourly pay for disabled employees is £11.08 compared to £12.30 for non disabled employees. Employability is partly a result of educational attainment: 23% of disabled people have no qualifications compared to 9% of non disabled people. Types of disability are an important factor: only 20% of people with mental health problems are in employment. Age: Young people have been particularly badly affected by the recession due to the reduced availability of jobs and cuts to spending on youth services, post-16 education and training alongside increased tuition fees. In the three months to July 2012 there were 1.02 million 16-24 year olds unemployed young people, an unemployment rate of 21.6%. Unemployment can have a significant impact upon later life chances, with young people experiencing lengthy spells of unemployment more likely to face unemployment and lower earnings a decade later. general population. 67% of offenders were unemployed at the time they were imprisoned. Qualifications are an important factor: 52% of male and 71% of female offenders have no qualifications. Caring responsibilities: People with caring responsibilities have lower rates of employment and are likely to work fewer hours and earn less than average. Those that provide unpaid care for old or disabled people have a low rate of fulltime employment: 82% of male and just 39% of female unpaid carers are in full time employment. 315,000 carers aged 16 to 64 in England have left employment to provide unpaid care and remain out of employment. The total public expenditure costs of unpaid carers leaving employment is estimated at £1.3 billion per year based on the costs of Carer’s Allowance and reduced tax revenues due to lost earnings. Homeless: Unemployment can be both a cause and consequence of homelessness. In 2005 Only 2% of homeless people are in full-time employment. 12% work part-time. 13% do voluntary work. 57% of homeless people have been unemployed for three years or more. With an employment rate of 15%, homeless people are five times less likely than the wider population to be in employment. The vast majority of homeless people want to work either now (77%) or in the future (97%). Geography: Unemployment rates vary considerably within the UK. Regionally, employment rates are highest in the East and South East of England (74.9%), and lowest in the North East (66.6%). Generic welfare-to-work support: charities such as the Careers Development Group (CDG) and Tomorrow’s People deliver support to help jobseekers of all types into work. They are typically funded to deliver services through government contracts such as the Work Programme. Employment advisors work with jobseekers to diagnose barriers to work and identify support needs which may include improving basic skills and job search skills, and overcoming personal barriers such as access to childcare and improving motivation. Where specialist support is needed, for example, helping drug users or those with severe disabilities, jobseekers are referred to specialist support providers. Specialist welfare-to-work support: some charities provide employability support specifically targeted at a certain disadvantaged group. They use specialist knowledge and skills to tackle barriers to work. For example, EmployAbility promotes access to employment for people with disabilities, and St Giles Trust helps ex-offenders into work. They support individuals to overcome barriers to work, and identify suitable employment opportunities. On-the-job support: particularly for disadvantaged groups, some charities provide on-the-job support to help those that have found work to remain in employment and tackle barriers as they arise. For example, Reach Skills matches people who have not been in employment for a long time with volunteers who provide independent advice and support. Skill development: some charities such as Groundwork and Community Links focus on developing people’s skills and employability as part of a wider mission to tackle poverty and improve communities. Support for young people (preventing NEET): promoting employability forms a key part of the work of many charities that support disadvantaged young people. For example, City Gateway support young people to access apprenticeships and vocational employment through helping individuals to gain qualifications, training and work placements. Advocacy: charities also play a key role in campaigning to raise awareness of issues facing certain disadvantaged groups in finding and sustaining work. For example, Stand to Reason campaigns and advises on how to manage mental health issues in the workplace. A number of key employability statistics are measured according to international guidelines specified by the International Labour Organisation (ILO). DWP use a number of definitions to define entry into employment and its sustainability for the purpose of triggering payments to providers. A job start is defined as the date that a participant starts a job that takes them off benefit, and a job outcome as a continuous of cumulative period of employment as defined for each claimant group. Incentive payments are also made to providers who convert a higher than expected rate of referrals into job outcomes. This is based on the number of job outcomes that would be expected to occur in the absence of the Work Programme, calculated through analysis of historical job entry rates. The UK Commission on Employment and Skills (UKCES) surveys employers on the availability and quality of labour supply through two major employer surveys conducted on a biennial basis. The UK Employer Skills Survey examines training and staff development, vacancies unfilled because of skills shortages, gaps in employees’ skills, recruitment of education leavers, and a host of other measures to provide a comprehensive and robust picture of skills needs and training investment in UK business. The UK Employer Perspectives Survey gains the views of employers on the employment and skills system. robust measures of distance travelled to employment as candidates may already have had the skills/knowledge accredited by the qualification prior to commencing the course. Beyond qualifications there is little standardised measurement of wider capabilities and barriers to work. contracts such as the Work Programme pay on job entry, rather than on ‘distance travelled’ by a jobseeker. This is problematic for some charities, as they typically support the most vulnerable groups who are furthest from the labour market. against five levels of monitoring categories (1: individual lacks appropriate level of competence-5: individual routinely demonstrates appropriate level of competence). This system has been abandoned—the current Work Choice programme requires providers to evidence distance travelled by jobseekers, but allows providers to develop their own bespoke systems for measuring this. The European Social Fund gives some recognition of distance travelled, with payments triggered for job-search activity and completion of qualifications and training, as well as entry into employment. In compiling this overview, we identified particular gaps in measurement of job-search skills , and the impact of employment on financial security and quality of life. NPC is currently working on developing shared approaches to impact measurement as part of the Inspiring Impact programme. This includes a project to develop a shared outcomes framework and tools which will allow charities that work in the field of young people’s employability to track ‘distance travelled’ by young people towards employment, including in soft skills. the quality of work (ie, skill level, pay and job satisfaction). The ability to achieve these outcomes is influenced by a number of external and internal factors. Macro-economic and political factors are a major determinant of an individual’s ability to find and retain quality employment as they influence the demand for labour from employers, and consequently the availability of work. External factors also impact incentives for employment, eg, government policy on welfare benefits can influence an individual’s willingness to seek work. On an individual level, there are a number of, often interlinked, skills and capabilities that impact upon employability. Employability skills, the ‘skills almost everyone needs to do almost any job’, includes general skills and characteristics such as functional skills (numeracy, literacy and IT skills), interpersonal skills (eg, communication and relationship building), self-esteem and motivation. Factors specifically relating to employment include attitudes to work, skills for finding work (job-search skills and presentation of skills to employers), and occupation-specific skills and work experience. Personal circumstances such as disability, caring responsibilities and access to transport also impacts upon an individual’s ability and willingness to work. For the purpose of this overview, employability is used to refer to the availability of relevant work, and the skills and capabilities specifically related to finding and staying in fulfilling work. It does not include general academic education and qualifications (covered in the education framework), general personal and social wellbeing eg, self-esteem and motivation (covered in the well being framework), or wider barriers to work such as caring responsibilities, disability and health which are covered in other frameworks. Getting people into employment is a major government objective in order to reduce poverty, promote wellbeing and boost economic growth (by reducing benefit payments and increasing tax revenues). The Department for Work and Pensions (DWP) is the government department with primary responsibility for helping people into employment. The Work Programme is the main scheme through which the DWP supports people to find and stay in work. This caters for client groups of varying distance from the labour market, from those receiving jobseekers allowance, to those facing more severe barriers to work such as people with disabilities, and prison leavers. The point at which an individual is eligible for entry onto the Work Programme, and the value of payments for providers is dependent on the client group to which an individual belongs, with earlier entry and higher payments for the most disadvantaged. Providers are paid based on results—getting people into sustained employment. There are no payments based on ‘distance travelled’ to employment or the ‘quality’ of employment an individual gains. Attachment: when a provider engages with a jobseeker. Job outcome: when a client has been in a job for a specified number of weeks (eg, 26 weeks for JSA 18-24 and 25+, 13 weeks for those on Employment and Support Allowance). Sustainment outcome: paid for number of weeks in continuous employment (eg, for JSA 18-24 year olds up to a maximum of 13 of these payments are made for every four weeks in continuous employment from week 30 onwards, and for those on Employment and Support Allowance, a maximum of 20 payments for every four weeks in continuous employment from week 17 onwards). Conversion rate: incentive payments are made based on the conversion rate of referrals to job outcomes. Alongside the Work Programme, DWP funds a number of other schemes to promote employability. The Work Choice programme supports disabled people with the most complex and long term barriers to find work. Providers are paid a 70% service fee when an individual starts on Work Choice, with a further 15% paid if the customer progresses into supported employment, and a further 15% if they progress into unsupported employment. apprenticeships and work experience placements. The European Social Fund (ESF) aims to improve employment opportunities in the European Union, helping people fulfil their potential by giving them better skills and better job prospects. The 2007-2013 England ESF programme is investing £5 billion to support the employability work of the government departments DWP, Skills Funding Agency and National Offender Management Service. specific barriers and practical issues, eg, participants who receive support with caring responsibilities. 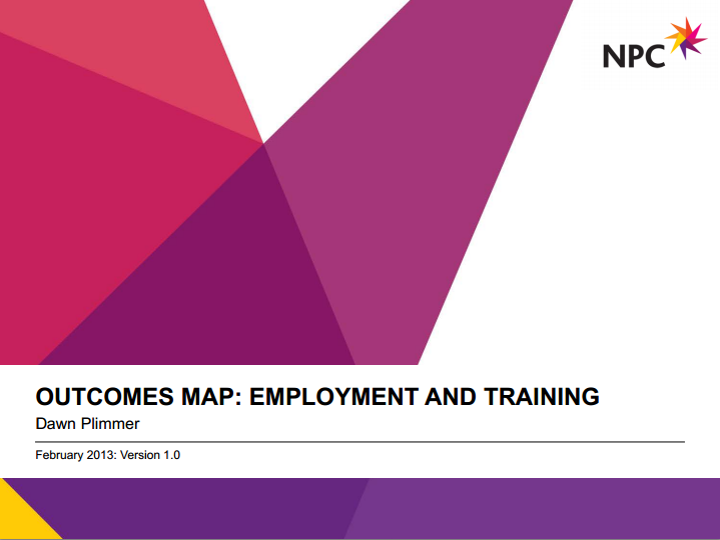 Results include job entry, and sustainment for six months after leaving the programme, plus ‘distance travelled’ measures such as the proportion of economically inactive participants engaged in job search activity or further learning upon leaving; and the number and percentage who gain basic skills, qualifications and undertake further education or training. Charities are involved in promoting employability in two main ways: helping people to improve their basic skills and address personal issues that may be barriers to work, and directly helping people to enter and sustain employment. results mechanisms preclude the involvement of those organisations that do not have sufficient upfront finance to support cash flow. Charities also play an important role in promoting skill development to support entry into quality work, rather than just job placement. These include charities that work with young people not in employment, education or training (NEET) or at risk of becoming NEET by helping to tackle risk factors (eg, offending, truancy, drug and alcohol use) and promote strong foundations for work (eg, educational attainment, self-esteem, team work). For unemployed adults, charities provide range of services from promoting basic skills, to tackling specific barriers such as homelessness, drug abuse and mental health problems. Hillage, J. and Pollard, E. (1998) Employability: developing a framework for policy analysis. Department for Education and Employment Research Report 85. Klein, C., DeRouin, R. E., & Salas, E. (2006). ‘Uncovering workplace interpersonal skills: A review, framework, and research agenda.’ In G. P. Hodgkinson & J. K. Ford (Eds. ), International review of industrial and organizational psychology (Vol. 21, pp. 80-126). New York: Wiley & Sons, Ltd.
McQuaid, R.W. & Lindsay, C. (2005) ‘The Concept of Employability,’ Urban Studies, vol. 42 (2), pp. 197-219. UKCES (2009) The Employability Challenge.